Discussion in 'general muscle car related info' started by Grumpy, Jul 20, 2015. I really appreciate and respect the advice that you have given me and other on CT over the last year or so that I have been a member. I was duped into buying a rebuilt 68 350 with 882 smogger heads, and over cammed, even though I was told it was a built motor. The motor does run well though, just no low end TQ for the street and my 4000lb impala. I would like to install aluminum heads to lower the front weight. I am looking for reliable 375+hp, and over 400tq in the Idle-4500 range. It currently has 280h cam, performer intake, 882 heads with z28 springs, 1406 600 carb, long tubes, and 2 1/2" exhaust. 700r4 with 2200 stall,3.70s and 27" tires. My budget is 2k for parts, and do you think that I should stay flat tappet or roller. Rollers are pricey and I do like to lean towards the old school flat tappet route. Thanks for the help in advance. I doubt youll quite reach 400 hp but youll darn sure have a more streetable combo with noticeably better low and mid rpm torque over the rpm band your using 90% of the time. going with a roller cam and lifters would cost enough, of that $2K budget, to exclude the purchase of better heads and the heads are more critical to boosting operformance. 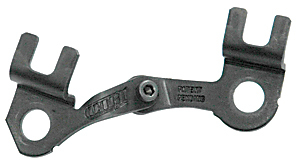 When installing the rocker arms, check to see that the inside of the rocker arms clear the spring retainers. 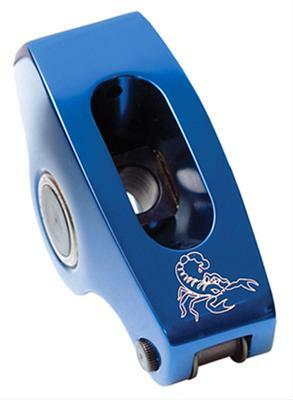 Many rocker arms have a "relief" to accommodate large valve spring retainers. "THAT PLASTIC THING" is a PUSH ROD LENGTH CHECKER, THE PUSH ROD LENGTH CHECKING, AND ROCKER GEOMETRY TOOL, ARE ENGINE SPECIFIC, so you MUST USE ONE DESIGNED FOR THE SAME STUD DIAM. SPECIFICALLY FOR YOUR particular ENGINE, and cylinder head design, to find the correct rocker geometry and push rod length. If you for example use one designed for 7/16" studs on a SBC and used it on a BBC with 7/16" rocker studs the result would not be close to correct, if the tool designed for one engine is used on the wrong engine, so be damn sure you use the correct tool. All I need is Rockers, what good but cheap Roller Rockers do you guys recommend from Summit, and should I go with 1.5 or 1.6 Ratio? Use 1.5 ratio rockers. You don't need the added stress 1.6 rockers on a street engine. I would highly advise calling CompCams and see if they would recommend the same cam as Summit did. 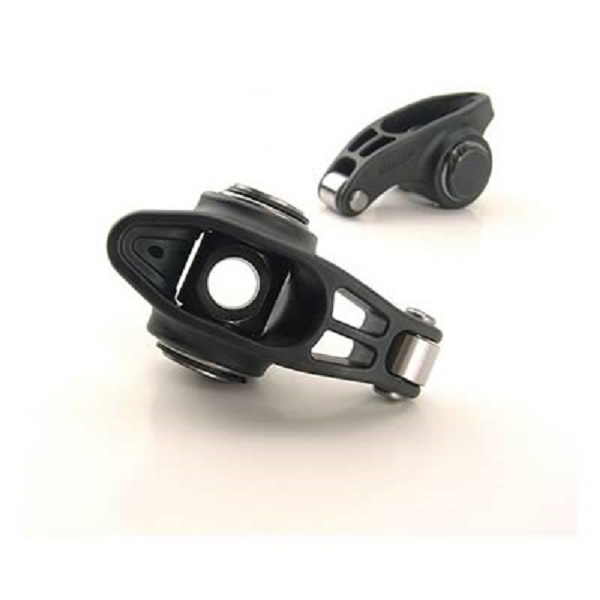 You've heard of 1.5:1 ratio and 1.6:1 ratio rocker arms. What does that really mean? How can you make more horsepower by using the larger ratio rocker arms? 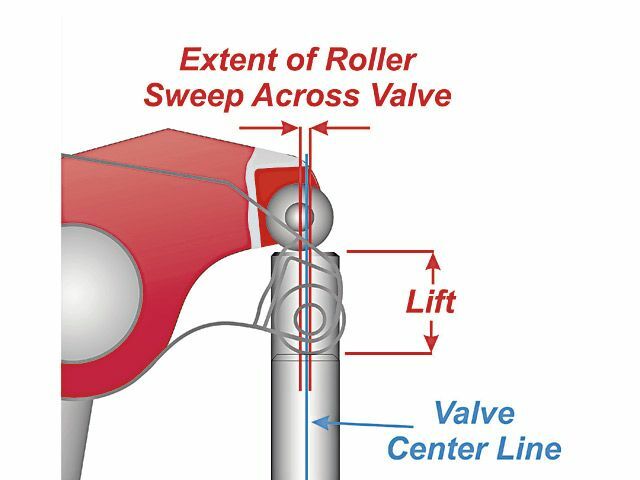 The ratio of a rocker arm refers to the amount of movement on the valve side of the rocker arm in comparison to the pushrod side. 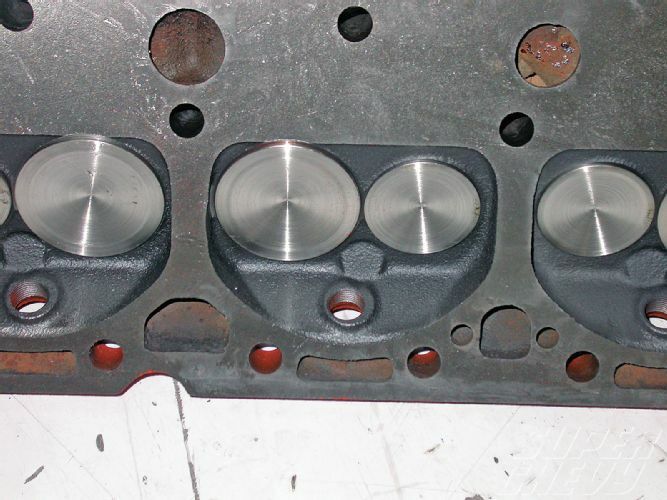 A 1.5:1 rocker arm will move a valve 1.5 times the lift of the cam, assuming all things are in proper working order. 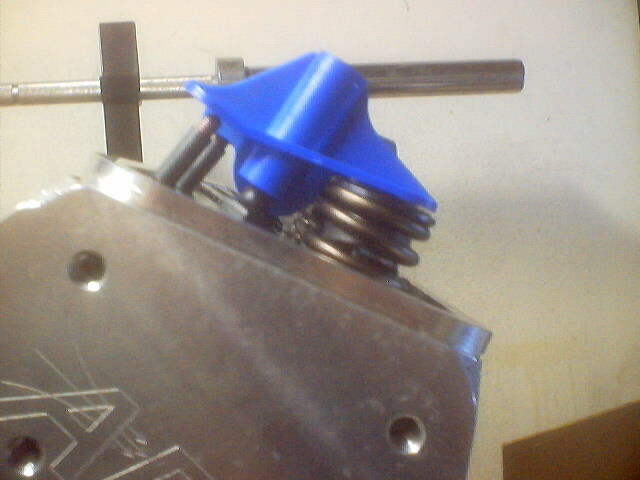 If your cam has a lift of .4 inches, multiply by 1.5 to get .6 inches of actual valve movement. With the same cam lift of .4 inches: If you do the math on a set of 1.6:1 rocker arms: Multiply 1.6 x .4 inches of cam lift. You get .64 inches of actual valve movement. 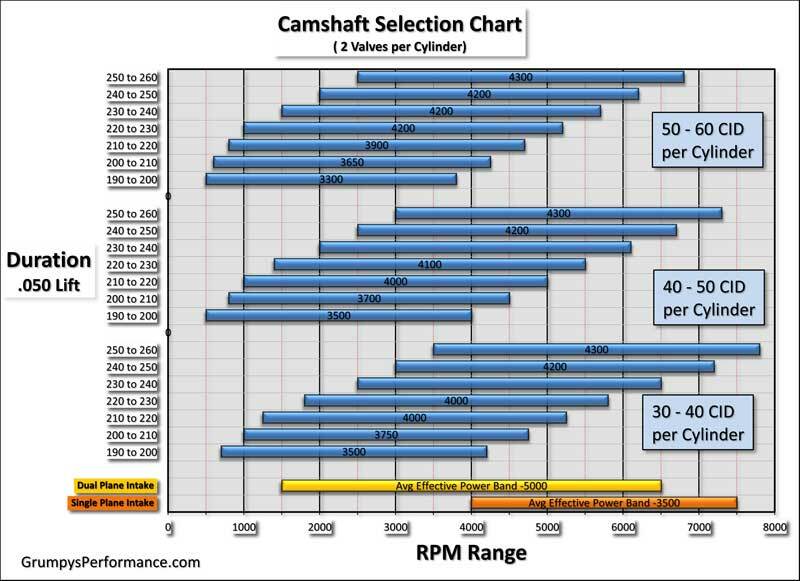 Essentially, changing to a larger ratio rocker arm is the same as increasing the lift of your cam the same amount. 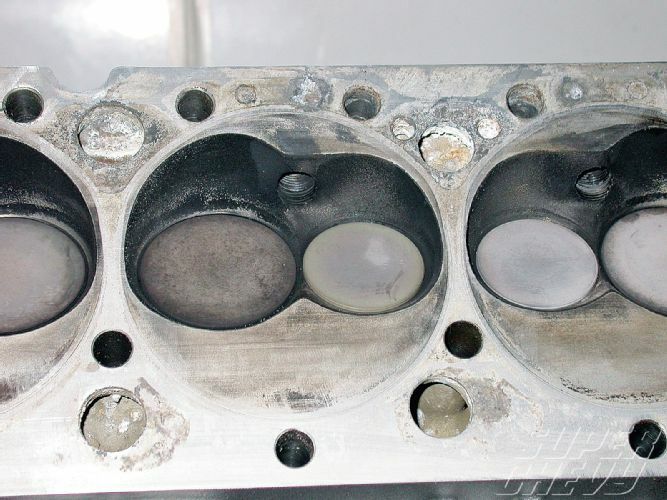 Opening both valves further usually is a benefit in the power department as your engine is capable of moving more air and exhaust through it. 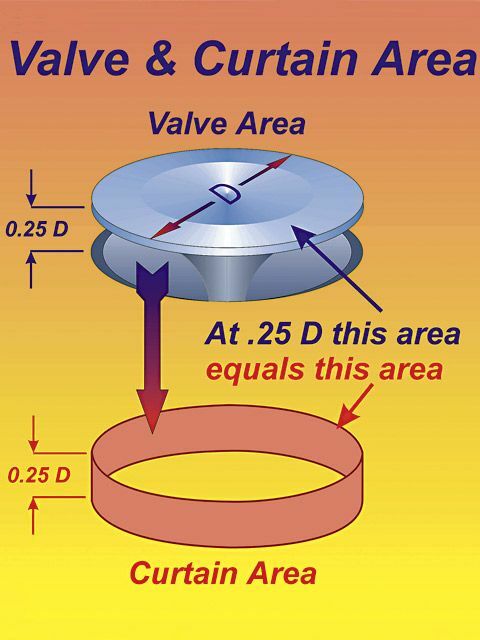 a roughly 16% gain in peak flow for roughly a 5-6% increase in applied peak valve spring pressure. but whats the valve spring load rate PRESSURE?